The potent health benefits of bone broth have been “discovered” recently by the health and fitness world. Many people drink it to lose weight, support joint health, boost immunity, improve their skin, and more. 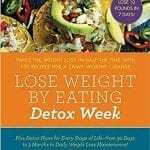 It’s very inexpensive to make and can be a healthy addition to both your diet and to your family’s diet as well. In this article, we will take a detailed look at the health benefits of bone broth, how to make it, and how to use it to best enjoy it’s health benefits. We’ve even included a delicious homemade bone broth recipe. Bone broth is a nutritious stock made by cooking bones from meat, poultry, or fish for long periods of time. The process releases minerals and other healthy nutrients. There are several bone broth versions, including beef bone broth, chicken bone broth, and fish bone broth. 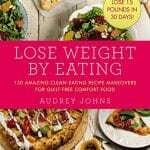 By adding some type of acid to the cooking process, such as vinegar or lemon juice, collagen and connective tissue is broken down into the broth. What remains is a tasty, nutritious liquid that can be used in bone broth soup and other recipes. 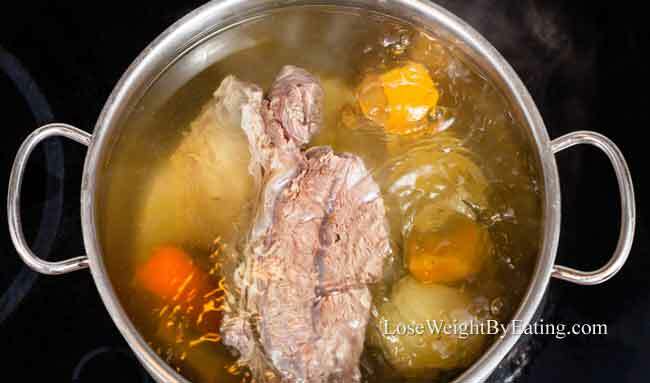 Key Point: Bone broth is a savory stock made of water in which bones, meat, fish, or vegetables have been simmered in. Bone – Yields minerals like calcium, sodium, magnesium, potassium, sulphur and phosphorus. Marrow – Good source of vitamins and minerals, including Vitamin A, Vitamin K, calcium, iron, phosphorous, zinc, selenium, magnesium, and manganese. Also contains essential fatty acids, as well as Omegas 3 and 6. Bone broth is relatively low in calories, about 86 calories for an 8 ounce serving of chicken bone broth. Key Point: Bone broth has high amounts of nutritious ingredients, including glucosamine and chondroitin which help with joint and bone pain. One of the primary components of bone broth with the most powerful benefits is collagen. It’s that jiggly layer that floats on top of the broth after you’ve roasted meat. Collagen is the protein found in connective tissue of vertebrate animals. It’s abundant in bone, marrow, cartilage, tendons and ligaments. The breakdown of cooked collagen in bone broths is what produces gelatin. Key Point: Collagen and gelatin, found in the floating layer of bone broth, contains many beneficial nutrients. It’s derived from the connective tissue of the proteins and bones. Here are the top 10 health benefits of bone broth. Try making your favorite vegetable soup with beef broth in place of water or stock for a healthy, low calorie snack. This is important because your stomach lining is the first defense against bacteria, yeast, and food particles from entering your system and bloodstream. A healthy gut ensures everything stays where it belongs and prevents inflammation or other illnesses. Do you have trouble falling asleep at night? Try drinking a mug of bone broth before bedtime, or take 3 grams of glycine supplement. It will help you fall asleep faster without drowsiness or side effects that come with medication. Glucosamine and chondroitin, found in broth, have been shown to improve joint health and reduce symptoms of rheumatoid arthritis and osteoarthritis (4). Osteoarthritis is more common as people age and is considered the leading cause of frequent joint pains. Gelatin and collagen help delay chronic inflammatory responses, which helps reduces pain and stops degenerative joint diseases from spreading. Glycine, which is an amino acid, acts similarly to some anti-anxiety and antidepressant medications, without the numerous side effects. Many people use glycine and other amino acids as therapy to naturally boost brain functions and impart a sense of calmness. Your skin is made up of an important compound called collagen, among other things, which helps your skin maintain a youthful and wrinkle free complexion. Collagen is also one of the main ingredients in bone broth. Bone broth contains lots of essential vitamins, minerals, and electrolytes, including calcium, magnesium, potassium, and more. These electrolytes help support proper circulation and heart health. It has also been known to help reverse heart disease by reducing atherosclerotic plaque build-up. Bone broth contains calcium, magnesium, phosphorus and other trace minerals important for proper bone development. So next time you feel a cold, try some chicken bone broth for a natural decongestant. Making broth at home is easy and often beats store bought broth both in taste and nutrition. Use good quality ingredients. Always select high quality bones from animals that were recently alive and healthy. Buy organic and grass fed cattle, free range chickens, and wild caught fish free from hormones and antibiotics. If you must buy from a store, make sure to find organic bone broth. Use leftovers. After you’re done with a roasted chicken, turkey, pot roast, or seafood meal, use the carcass and bones to create an inexpensive bone broth. Freeze leftover bone broth. You probably won’t be able to use all the bone broth you make in one recipe, so you’ll want to freeze any leftovers in jars for later use. Just be sure to leave some space at the top of the jar so the liquid can safely expand when frozen and not break your jar. 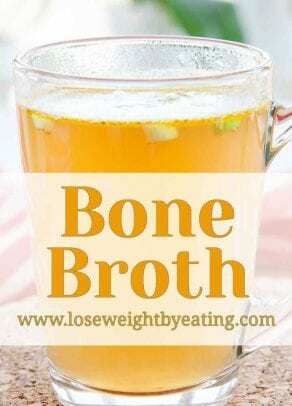 Here is a simple bone broth recipe to try. The most common version of this is a beef broth recipe, but the same steps can be used to make chicken bone broth or fish bone broth. Place bones (and vegetables) in a large stockpot or slow cooker and cover with water. Leave room at top for water to boil. Add the vinegar (helps bring out nutrients) and then bring pot to a boil. Reduce heat and add salt and pepper. 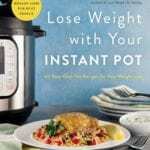 Let simmer for 6–48 hours (the longer it simmers, the tastier and more nutritious it will be). Allow the broth to cool before storing in large mason jars. After it’s done cooking and has cooled in it’s individual mason jar, the broth will have a layer of hardened fat on top. 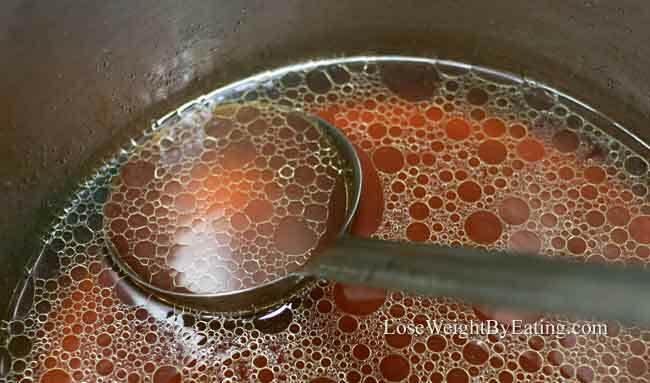 This layer serves to naturally protect the broth beneath. Remove and discard this layer only when you are about to eat the broth. Leftover Tip: You can store leftover broth in an airtight container in the refrigerator for up to 5 days, or in the freezer for up to 3 months. We like mason jars, but gallon freezer bags also work well and store flat in your freezer, just be sure to double bag them and check for leaks. Bone broth is an amazing superfood full of minerals and other healing compounds such as collagen, glutamine, glycine and proline. Homemade bone broth is inexpensive and easy to make, so try making a pot of it and have a cup or two for breakfast every morning. You’ll be amazed at all the wonderful bone broth benefits you’ll feel after only one week of drinking the stuff. Enjoy!